Disclaimer: I received an Sabre Runner Pepper Spray Gel to review as part of being a BibRave Pro. Learn more about becoming a BibRave Pro (ambassador), and check out BibRave.com to review find and write race reviews! 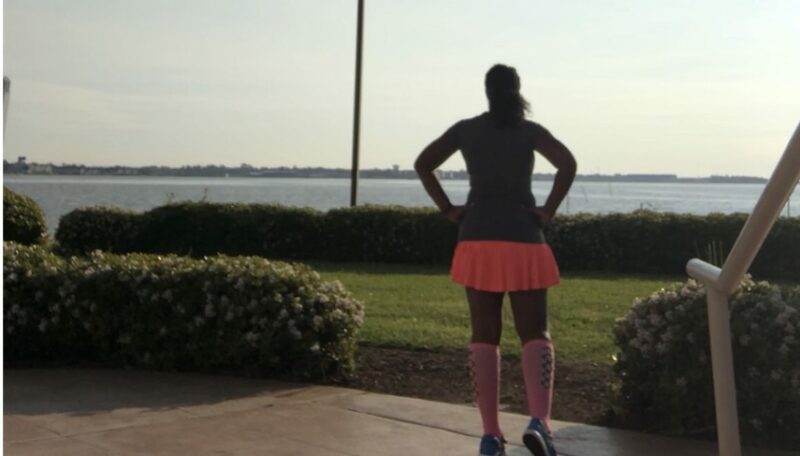 Like most runners, especially women, I’ve re-evaluated my safety running plan with the most recent events that have not only occurred across the country, but in my own backyard. I found myself checking off multiple boxes of safety such as being visible, wearing a Road ID, changing my route often, letting people know where I’m going, etc. But the reality is, and what reality has shown us, just because we do all these things does not mean we’re guaranteed to be out of harms way. I’ve flirted with the idea of running with pepper spray for years, but I’ve always chickened out because I was fearful of needing to use it, and spraying in my own face, or just the general spray back from it. Sabre has eliminated those concerns by creating a gel formula that reduces spray back. After getting the product, I also learned that the design is practically fool proof and it would take a lot of effort to spray myself on accident. You simply move the red tab over to “unlock” the spray, and push down on the same tab with your thumb. It takes just one finger to fully unlock and engage the spray so you can quickly get to it as needed. It also came with a holster and a strap that was very comfortable on my hand. Since the strap was adjustable, I didn’t find myself gripping it, but rather just letting it rest naturally in my palm. Which was great since I would often forget that I was holding it, since the gel spray also didn’t bounce and hit my hand in any weird spots. I highly recommend carrying pepper spray if you’re going to be doing any outdoor activity. It’s not so much about stopping human to human crime, but it’s also beneficial to keep wildlife, and other animals at bay when you feel a sense of danger. Another quick note about Sabre Gel Pepper Spray is that not only does it have a 10ft reach, it has unique UV dye that aid in suspect identification… and let’s be real… it’s important that these individuals are properly identified, since in the dark you may not be able to see a face, but the dye won’t lie. To learn more about Sabre Gel Pepper Spray and their other products click here. Also to check out what the other BibRave Pros thought about their Sabre Pepper Gel Spray.